So CNN reports today that William Shatner and Priceline are celebrating their 10th anniversary together. I hadn't realized how long it had been since Shatner first appeared on TV, singing his campy renditions of current pop hits. The campaign's success is one of those advertising paradoxes: badvertising is often every bit as effective as great advertising. Especially when the product in question has low price as its main selling point. For some reason, we seem willing to accept that a brand that's selling us on its low prices- be it a car dealership, an online travel resource, or Crazy Eddie- is best served by over-the-top, in-your-face ads that manage to stick in our respective consciences far longer than charming, strategic ones. have to comment on this one. i worked on the launch of priceline.com. we had all these great ideas for what was then a very exciting and great use of the internet. gaming for cheaper airfares. consumers win, airlines win. lovely! then we present our ideas to the guy who founded priceline in his sci-fi memoribilia festooned office. 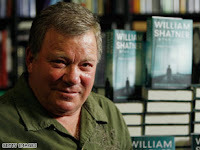 he listens to our ideas and then says, "you guys consider using Shatner?". like it was inevitable that we would. we say no. he shrugs. turned out he'd already made a deal with Mr. Shatner to be the priceline spokesperson. he was a trekkie and Bill's wife knew his wife or something. and he's been there ever since. shatner was very nice btw. for some reason i could never fathom, the whole online travel category's advertising has morphed into kitsch/camp heaven. @TSR: I can always count on you for the (priceless) story-behind-the-story. Read the CNN article- they claim that it was between Shatner and Bill Cosby. Maybe the CEO's wife was really into Jello? I suspect the continued success of Priceline is a goodly part of the reason their competitors adopt a similar tone in their advertising. by the time we met them, it was very clearly shatner. no mention of cosby. the founder's office was like a monument to short attention span btw. full of machines and sculptures that endlessly twirled and rolled silver balls around. perpetual motion etc. the most distracting environment ever. very funny. in retrospect!